"The program reveals that ancient civilizations suffered from the consequences of overpopulation and over-exploitation of resources and shows that, through archaeology, we can apply the lessons of the past to the present." Interactive WebSite -- The Collapse: Why do Civilizations Fall? Use this humanistic approach to archaeology and anthropology to make connections between past civilizations and modern societies, including how societies function and change. This series helps bring cultural ecology to light using physical evidence and scientific detective work. On-site filming at the spectacular Classic Maya center of CopÃ¡n, Honduras, shows archaeologists reconstructing this ancient society. In addition, past and present cultures in Central and North America, Africa, Europe, and the Middle East are explored. Produced by Pennsylvania State University and WQED/Pittsburgh. 1993. The decline and fall of civilizations captures our interest. Could we be next, going the way of the Sumerians, the Romans, the Maya? The collapse of Copan, brought on by overpopulation and overexploitation of resources, is explored, along with other ancient cultures that have faced the problems we confront today. "Hundreds of years ago in what is now modern Honduras, CopÃ¡n was a thriving center of Maya life. Tens of thousands of people made their home in the CopÃ¡n Valley. 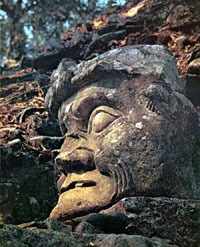 Yet despite its importance, CopÃ¡n went into decline. Across the vast territory of the ancient Maya, other important sites were sharing a similar fate. Classic Maya civilization was collapsing." "Why did this great civilization fall? The history of humankind has been marked by patterns of growth and decline. Some declines have been gradual, occurring over centuries. Others have been rapid, occurring over the course of a few years. War, drought, natural disaster, disease, overpopulation, economic disruption: any of these can bring about the collapse of a civilization. Internal causes (such as political struggles or overfarming) can combine with external causes (such as war or natural disaster) to bring about a collapse. What does this mean for modern civilizations? What can we learn from the past?" Rome crumbled 4th century A.D.
but in Mexico (Mayan area) the irrigation is insignificant, no major climactic changes took place, there were no major disasters, so what caused the downfall of the Maya? but what was happening to the common people? what were the factors, mechanisms and process of the decline? fell in the 4th century A.D.